This Chevy Camaro is a perfect blend of its classic heritage with modern technology and engineering with spectacular performance to boot. 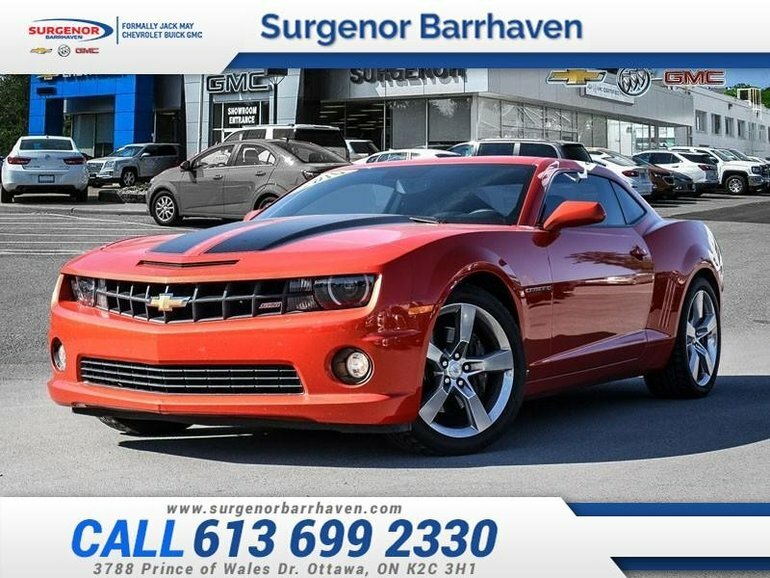 This 2010 Chevrolet Camaro is for sale today in Ottawa. A muscle car icon has returned as the 2010 Chevrolet Camaro, a two-door sports coupe that brings 1960's style into the 21st century. The Camaro name returns after a six-year absence as an all-new sports car with styling inspired by the original Camaros, paired with thoroughly modern powertrains and some of the latest high-technology interior conveniences. On top of that, it's an outstanding value!This low mileage coupe has just 61940 kms. It's orange in colour and is completely accident free based on the CarProof Report. It has an automatic transmission and is powered by a 6.2L V8 16V MPFI OHV engine. This vehicle has been upgraded with the following features: Leather Seats, Bluetooth, Heated Seats, Premium Sound Package, Siriusxm. 6.2L V8 16V MPFI OHV - 8 cyl. Interested in the 2010 Chevrolet Camaro 2SS - Leather Seats - Bluetooth ?